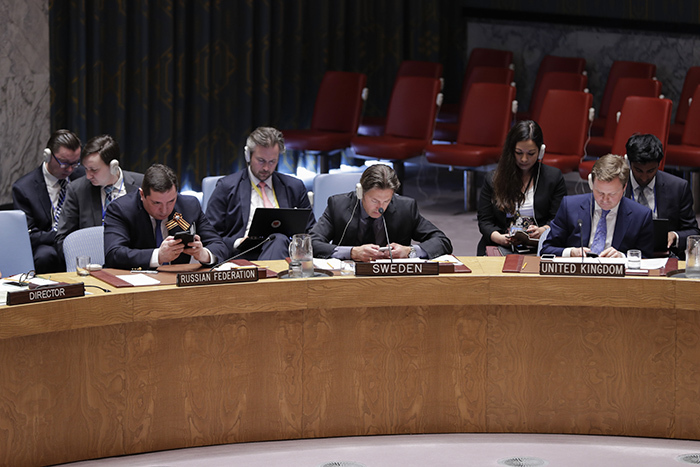 United Nations, New York, USA, May 08, 2018 – Heavy Phone Usage During the Security Council meeting on the situation in Bosnia and Herzegovina today at the UN Headquarters in New York City. For diplomats at the United Nations sitting in a meeting listening to others’ usually predictable speeches has never been easy. But smartphones have increasingly turned such meetings into reading, text, Tweeting and web surfing sessions with meetings of the mind become even less frequent. Is the smartphone killing diplomacy? It doesn’t have to. The question is, what are the diplomats reading and doing on their phones during these sometimes endless meetings? They could, for example, be fact checking the speeches they are hearing. There are been citations this year in the Security Council to the Vietnam War and the shooting of students at Kent State, to Sherlock Holmes and Alice in Wonderland. So the diplomats could be learning. Some Ambassadors have to vet not only their votes but also each portion of their speeches with their capitals. Using a smart phone could allow even more timely edits, and prevent speeches from being needlessly out of date. For those who can’t get enough of the speeches, the UN’s website contains archived video from previous sessions. While the transition from Real Player confined many other meetings to the ash-bin of history, there are still millions of hours of past speeches to watch, many of them better than today’s versions. But best of it, it would seem, would be to communicate in real time during meetings. Already, some diplomats live-tweet from the Security Council consultations room. That communicates with the public at large. But one can imagine the sometimes shifting coalitions in the Security Council planning their next move during a meeting, for example deciding whether to walk out of the Council chamber during a subject country’s speech. They could consult the Periscope live stream of a journalist at the stakeout to see if it was, as usual, empty. They could eventual using the smartphone technology to appear virtually, saving both time and strain on the environment. So maybe that’s what they are doing on their phones. Time will tell.